I quite like the idea of having specific tools for a specific purpose but not quite so keen on having to pay a small fortune for the privilege. 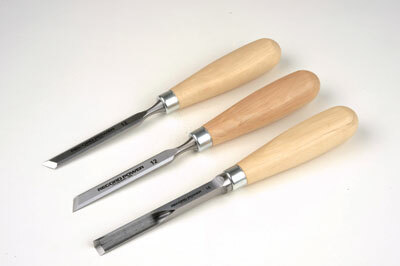 This set of chisels from Record Power includes a pair of handed skews and a corner chisel. Just shy of Â£60 theyâ€™re not going to break the bank but do I really need them? Daft question I know when we so often get the true meaning of need and want confused in the tool shop. Thereâ€™s not much you canâ€™t do with these chisels that you can already do with your existing kit but, at least for the skews, they do allow access to tight corners without bruising surrounding edges such as cleaning around the pins on lapped dovetails. Used straight-on the edge presents itself to the task in a shearing action helping to achieve clean cuts with less effort. Along with two other sets from Record Power these have oval shaped hornbeam handles so wonâ€™t roll off the bench. The handles are quite large but oddly the balance is fine. This might be more of a problem for the smaller chisels in this range and if you gain pleasure from seeing your chisels all neatly arranged on the rack then a common size will have much appeal. 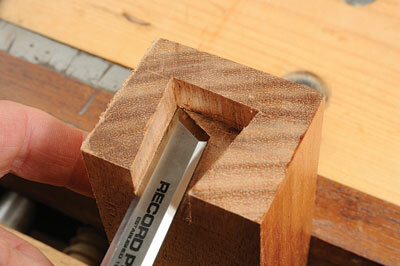 The corner chisel is undoubtedly suited to being struck with a mallet and therefore hornbeam is a good choice. The blades are manufactured from chrome manganese steel, prized for its high tensile strength and resistance to corrosion. Although not unique in the market the steel/hornbeam combination is. 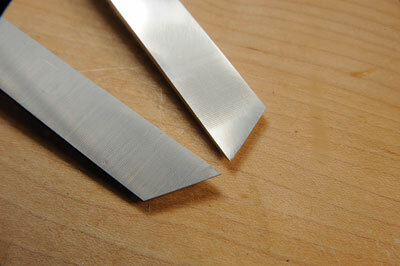 Rather than being cold quenched and reheated to harden, these blades are isothermally cooled. The process involves quenching them in molten salt to gradually reduce the temperature. Hardened to Rockwell 59, over twice the area is hardened compared to the standard cold quenching method of many other chisels. I spent less than an hour polishing the backs on all three and obtained a perfectly acceptable edge freehand on my 3M lapping films. The corner chisel is somewhat awkward to sharpen but a few gentle strokes with a diamond plate were sufficient. If you are serious about your woodwork then you will find a home for these because they are great value, you might even improve your technique along the way. By comparison a pair of skews complete with hornbeam handles from Lie Nielsen will set you back around £80. I found further examples for considerably less but doubt their quality.